Get a FREE Handmade ceramic Spoon Rest when you spend $75 dollars on line or at our store on the corner of West Main and Lake Street, on the river in Salisbury Maryland. The store is bursting with great unique gifts! From bamboo or cotton FUN socks, thick knitted coats from Italy or lace dresses to our handmade ceramics and artwork. If you would rather choose a book then a spoon rest choose from 4 beautifully illustrated Legendbooks-or the famous Trumpzine. Dana will sign and personalize the books for you. The Trumpzine are a hot gift this year, because humor is always helpful. 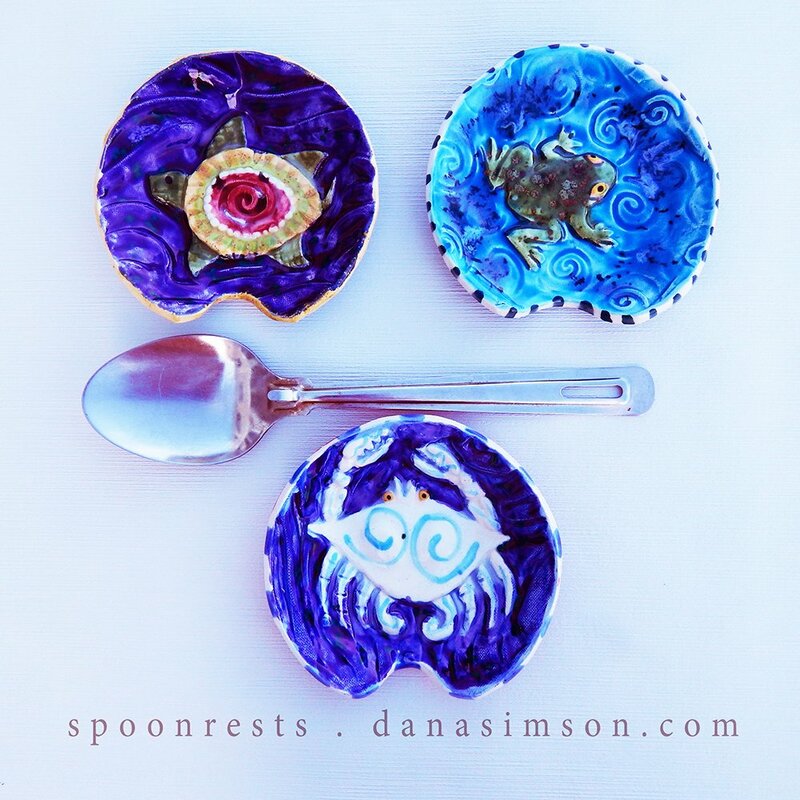 10 designs of spoon rests to choose from! You may have trouble choosing which one. Good news! They are $18.00 per or 2 for $30.00. Each spoon rest is handmade in ceramic are 5 inches, round with a notch for the spoon. A customer came in requesting a spoon rest and I thought, ” I need a spoon rest too!” My most appreciated and useful products are always those I need. The spoon rest line has grown as customers request new designs. I always love to hear your suggestions for new product. Each one is made individually by me in my studio! I roll out clay and press it into reverse relief tiles I made from a master tile. This process is like making a print, but using clay rather then paper. Next, I press the butterfly garden relief into a shallow bowl form. If the spoon has gloop on it, that will stay in the bowl. I cut a notch for the handle of the spoon. The spoon rest dries and is fired to bisque. Afterward, I paint in the details with underglazes, adding the flow glaze that defines the back ground texture. Finally it is fired once more with clear coat that seals the clay body in a thin layer of glass. This guarantees it is food safe and durable. My thoughts are in Paris at the climate change summit. Thanks to Jerry Brown, Al Gore, Paul Hawken and those that are working proactively independent of the irresponsible Trump administration deniers. Purchase any Earth Ark product on Danasimson.com and I will donate 25% to The Chesapeake Bay Foundation or the Climate Reality Project. Art Print: Earth Ark. I believe the earth is our ark. We are all in this together and our ship is precious. The archival art print; Earth Ark is a 10×13.5 image area centered on 13×19 cover stock paper. Backed with foam core & shipped in a plastic sleeve. Hand signed by Dana Simson. The earth is our ark carrying all creatures as her precious cargo. The original oil painting for this image is 4.5’x5′ and hangs in an eye surgery clinic. Patients that have had surgery tell me how pleased they are post surgery to see this painting with its delicate detail. All my images are available in archival prints. While I have specified a size, you may speak with me if you need a larger or smaller version. It is also possible to have the image you want printed on canvas. I can give you a price based on size. 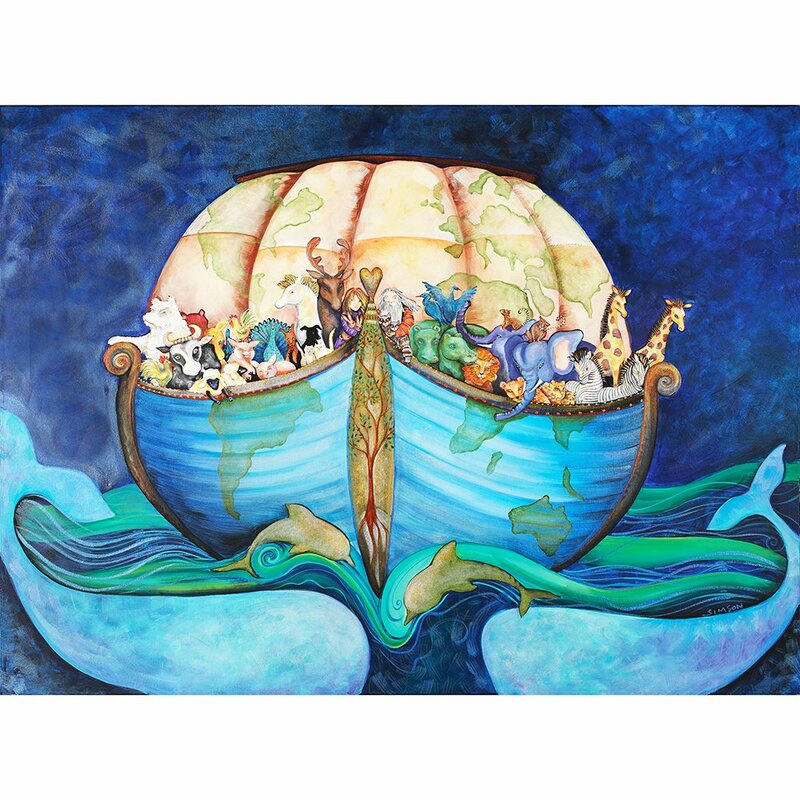 This popular ark image is available as a clock– all types, ornament, gift card and more. Visit our Gallery/ gift store on the Wicomico River in Salisbury, MD full of original paintings, prints, handmade jewelry and gifts by Dana. There is also always something new to discover in unique finds, “green products” or fair trade items. It is a renovated hotel – now with 4 artfully decorated lofts upstairs available to rent. (Loft Links: Grande Luxe / Chic Sunny / Retro Loft / Spacious& Gracious)Downstairs is yummy Riverwalk Cafe and the Ugly Pie Bakery. Well worth a road trip! Portfolio: Kitchen Garden tile backsplash. I created these tiles for my garden and beer making friends extraordinaire to scatter throughout their kitchen backsplash of plain pale gray tiles. The bursts of color, and clay relief of the individual tiles jolly up the room while keeping its sunlit pristine simplicity. They grow each of the crops in their garden and my friend Jan is a beekeeper- so the tiles have added significance for the family. She had purchased my kitchen garden painting and was inspired to reference it in the renovation of the kitchen in their country farmhouse. 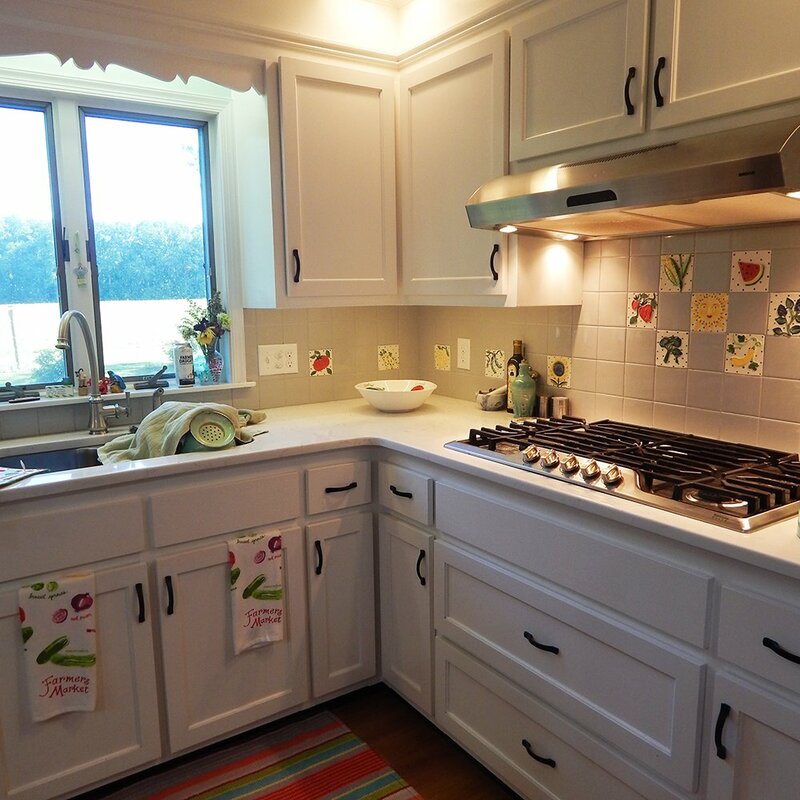 The kitchen is just lovely and will host many a wonderful party in style. 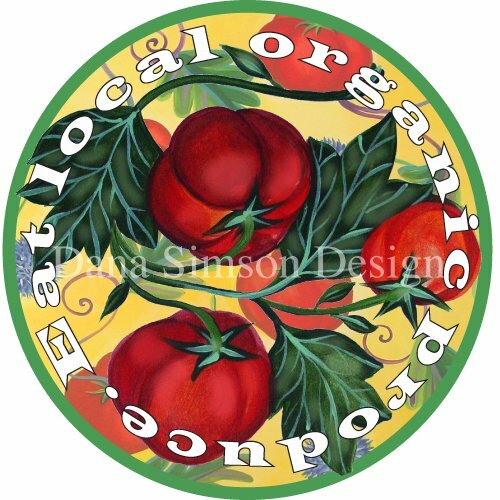 Jan requested each tile have individually sculpted raised imagery of the yummy produce she and her husband Jim grow in their extensive garden. From blackberries to tomatoes, asparagus to eggplant the tiles tell of Jan and Jim’s love of gardening. She also requested a sunshine- see centered tile above the stove and a Honey Bee. Both instrumental ingredients in any kitchen garden. The kitchen garden tiles are created to be installed with standard 4×4 tile. 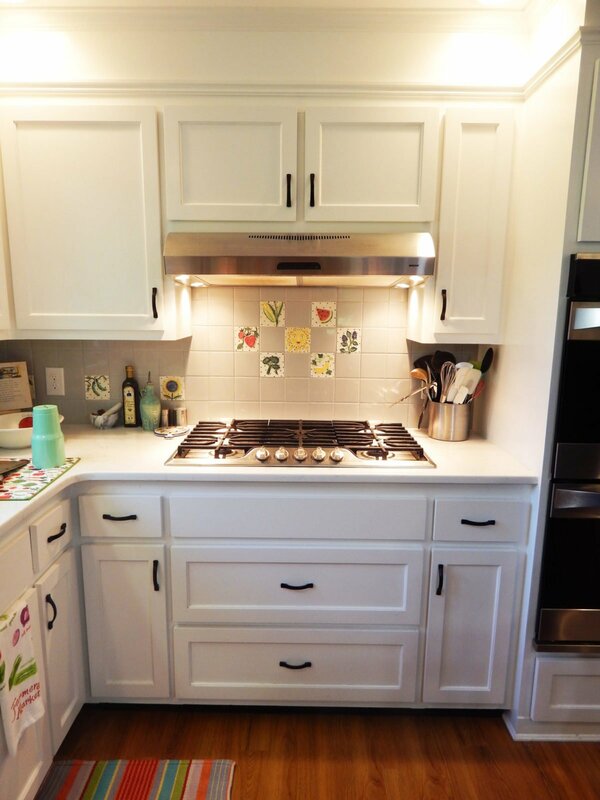 Each custom job is geared to your wishes-We have done bathrooms, mantle surrounds, kitchens, stove and sink backsplashes, showers and custom table tops. 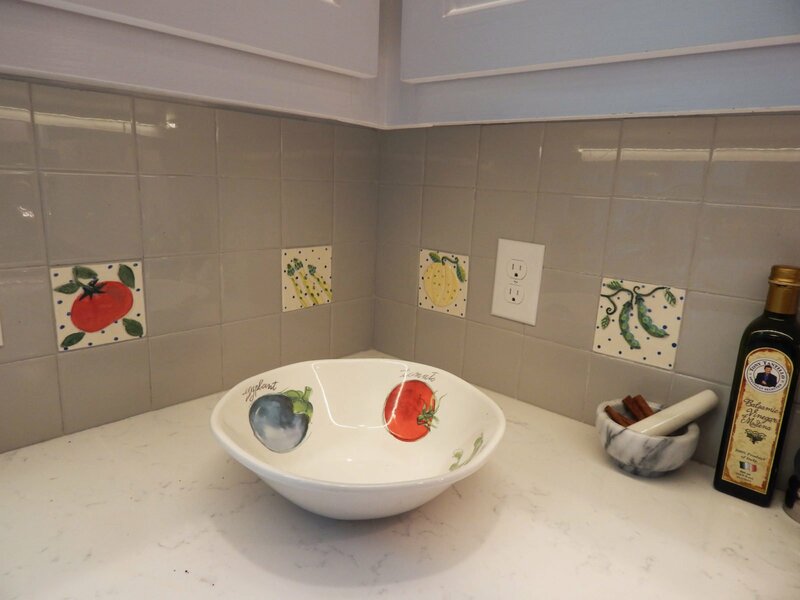 Our tiles are handmade and decorated in our studio on Maddux Island on Maryland’s Eastern Shore in the USA. Pricing is based on quantity of tile and complexity of design. Measure the space in which you want to include handmade tile. You can scatter our handmade tiles throughout commercial tile or we have also done tile murals covering an entire wall. Give us a call at 410.603.0531. We will create a layout design and price quote. We ship nationwide. Visit our custom tile section at Chesapeake East and get inspired! 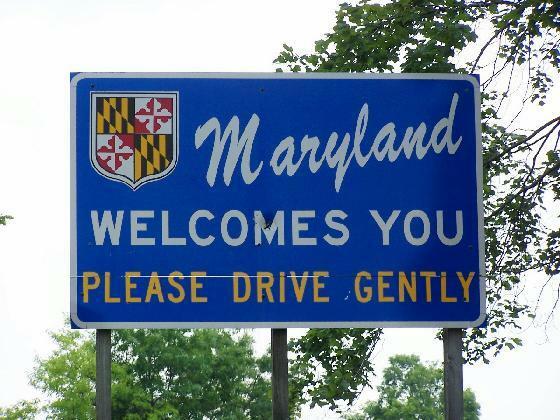 There is a Maryland highway sign that welcomes you and asks you to please drive gently. When we moved to the Eastern Shore of Maryland 30 plus years ago- we were greatly and derisively amused by the “Welcome to Maryland . please drive gently” sign. Coming from the drive aggressively or be flattened mean streets of NYC, the sign struck us as quaint at the least. After living out in Frenchtown, Maryland or 6 months or so and waving to our few neighbors as we passed on the road, (If you didn’t they would think you were upset with them)we returned to NYC to see some friends. Our driving habits had mellowed and my hand flew up by habit to wave at another car. The driver looked astounded, then mistrustful cursing us, then perplexed careening into our lane. Needless to say I slowed down let him swerve ahead. Driving gently- on the road and in life, a nice way to roll. SEED; spread empathy each day. I am working on a book with my imagery and stories on empathy. How to grow it within yourself and spread this feeling to those around you. In this manner maybe the current culture of mistrust and aggressive behavior can begin to be modified. I find that by finding empathy for the smallest creatures around us- my heart opens for all. Dragonflies are a special delight as they whirl around our garden and yard here on the Eastern Shore of Maryland. Not only do they eat mosquitoes – they are lovely and gentle. One will land on your shoulder like a reassuring hand. I spend quite a bit of time fishing them out of the pool and placing them on a leaf to dry out. I guess this notion of “driving gently” has become the way I operate in general. It brings peace within to treat the world gently. If many more of us would “drive gently” just think of the world peace it might inspire. Spoon rests were requested by a customer and I realized that we needed one in our kitchen too! Our spoon rests are fun, functional art work for your kitchen. The round handmade ceramic spoon rest has a notch for the spoon. Its shallow bowl shape catches any gloop from your culinary creation, keeping your stove tidy. A hand-painted raised image on a colorful background decorates the inside of our spoon rest. Each spoon rest measures 5 inches in diameter and is glazed front and back. Every spoon rest is food safe. Just wipe clean with soapy dishwater. A spoon rest is a useful gift for anyone. It will brighten up your kitchen along with keeping it clean. We have added a hole at the top of our spoon rests. You can hang it on the wall as a decoration when not in use. Several spoon rests hung in a group look great in any kitchen. Our spoon rests are handmade & painted, food safe and functional. Police officers deserve our empathy in this current culture of mistrust and quick judgement. True, there have been many horrible mistakes made in haste or misjudgments of character and intent made by police officers in the line of duty. There have been corrupt police that we hear about in news stories. However the majority of people who choose to become police officers willingly put themselves in positions of danger and ill-will daily as they work to keep the peace in our communities. I was honored when Barbara Duncan, chief of the Salisbury, Maryland police force asked me if I would paint an image to inspire them during these difficult times. Barbara is an amazing person, even handed, competent and calm. She is respected by her police officers, and the greater community. We all feel fortunate to have her at the wheel of our diverse town in the center of the Delmarva Peninsula. An eagle holding a gold star guards a nest of diversely colored birds in a nest. Olive branches cross and frame the image topped by the eagle’s wings. In the distance is a vista of our Chesapeake Bay. 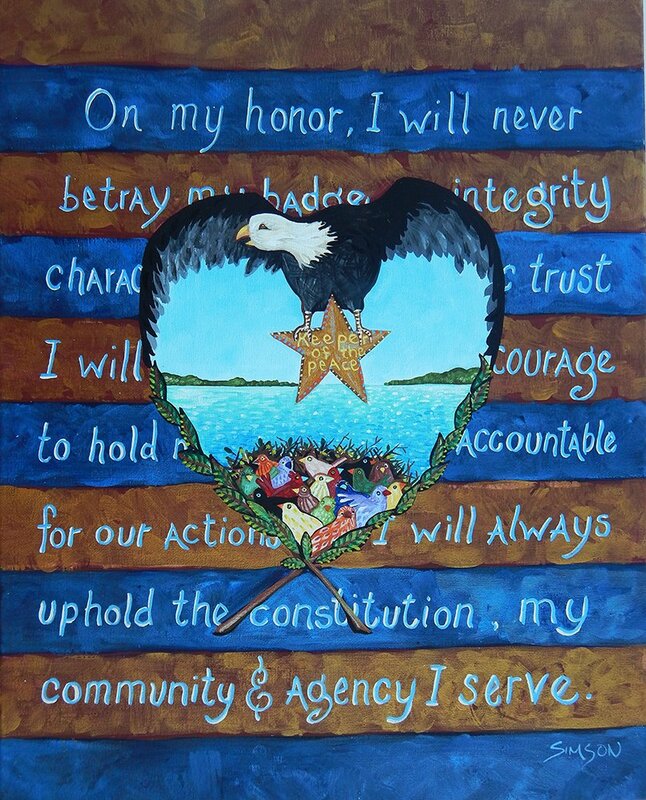 The background contains the Police officer’s oath over gold and deep blue stripes. Barbara had wanted to include “keepers of the peace” in the painting. Which I believe sometimes people forget is what police officers work to do. The central gold star was just the place for that. Police officers uphold our nation’s laws to maintain a level of civility that allows communities to function. I am happy to say Barbara was very happy with the painting and it is hung where the police officers can see it and hopefully feel uplifted. Being in a position of authority automatically separates you from others. It places a layer of animosity/caution into interactions with people. It is hard laying down the law. Just ask any parent or school principal. Our police officers do this everyday with folks that dislike and appreciate them far less. This Custom Wedding Large Platter Happy Nest is a perfect wedding gift to wish your love birds a happy marriage. It may be customized for weddings or an anniversary gift. All our hand painted dinnerware is food safe. With proper care it will last forever. 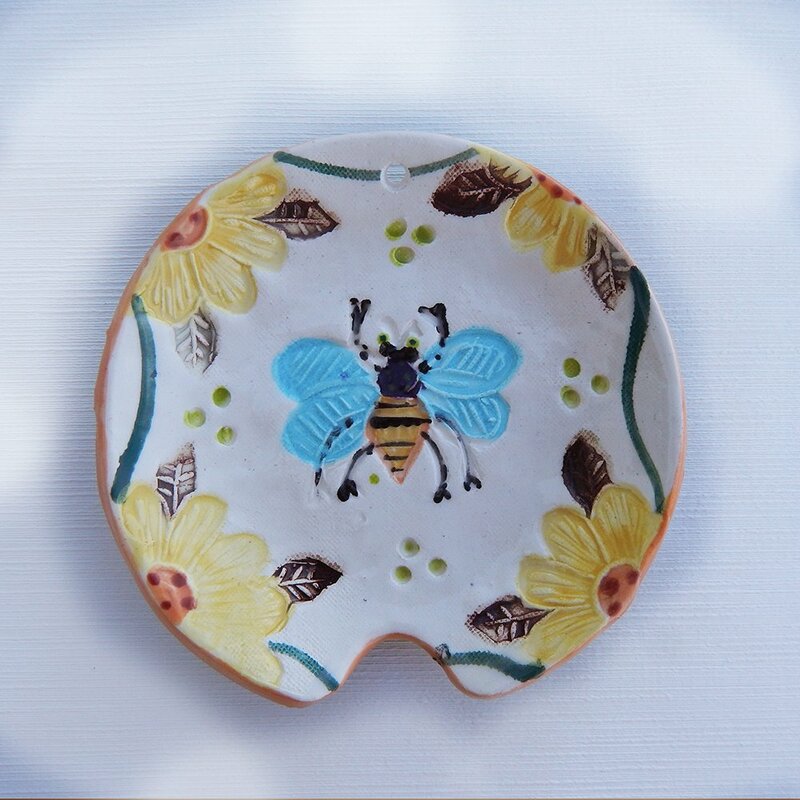 Use the platter to serve food or use as beautiful wall decor. Plate hangers clip on for easy hanging. 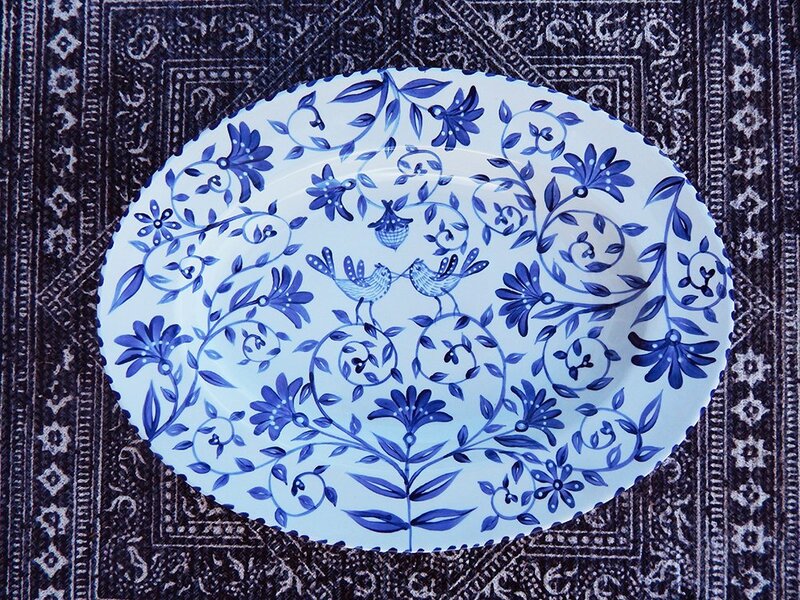 Each platter is hand painted in cobalt blue brushstrokes. The vine floral design surrounds two birds facing one another. The vines form a heart and a single acorn hangs over the two love birds. The acorns represent the beginning seed which will grow over the years into a of a long, strong marriage. 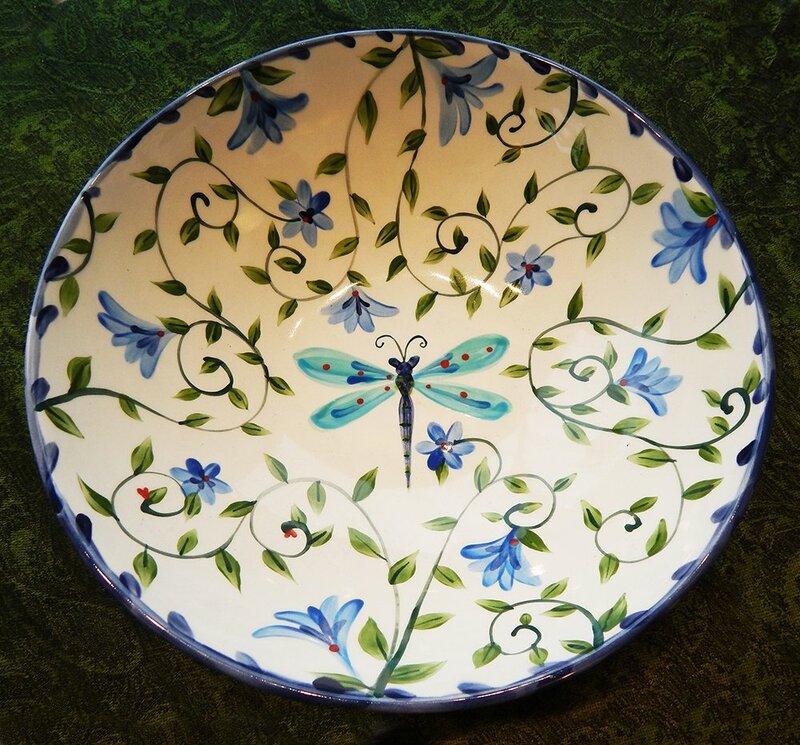 The Custom Wedding Large Platter Happy Nest is about 22 inches across by 14 inches wide and 2.5 inches deep. All our dinnerware is Food safe. Choose a complimentary Gift Card from my designs. There is a Happy Nest card, along with a “bloom together” heart card and other wedding or anniversary appropriate cards. I am happy to personalize it for you with the bride and groom’s first names and wedding date. Or submit any other short phrasing you might like on the bottom of the bowl. 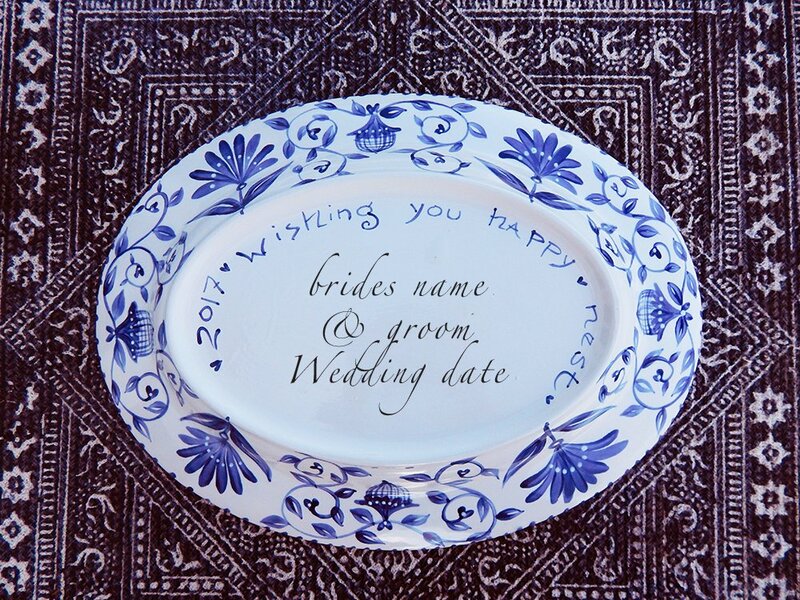 Collect matching ceramic dinnerware to Custom Wedding Large Platter in Happy Nest pattern. 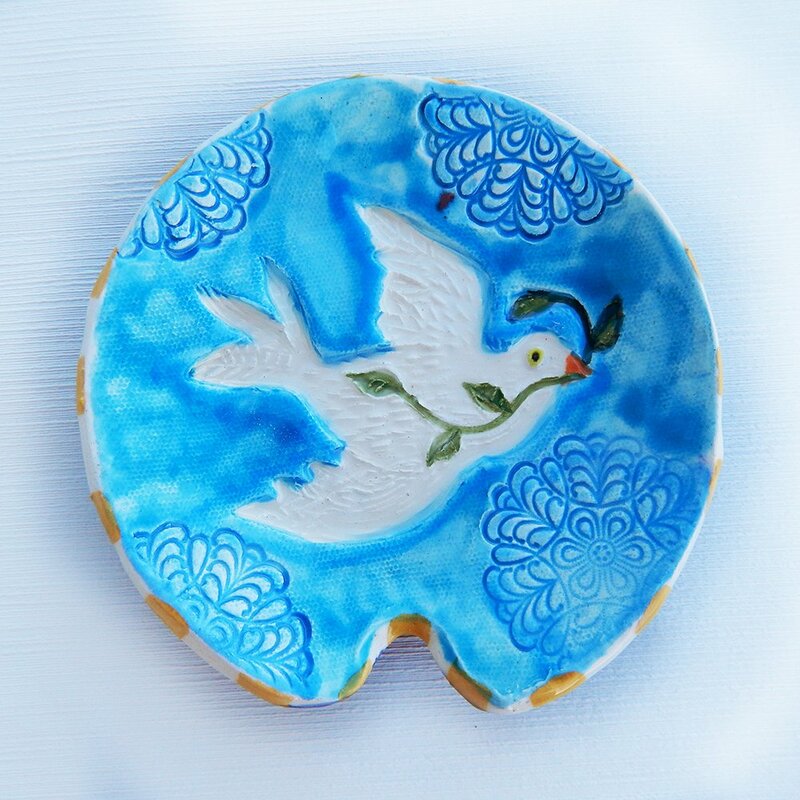 Collect matching ceramic dinnerware for the wedding platter Happy Nest delft blue birds pattern. Give complimentary pieces such as the “Happy Nest”serving bowl, smaller platter, wedding goblets, or other dinnerware to match the serving bowl. Our collectable custom dinnerware can be given at the wedding shower, wedding or on subsequent anniversaries. Farmer’s markets showcase hard work, integrity and the labor of love. Tuesday’s organic Farmer’s Market here in Salisbury is always such a treat. Smiling people stroll from booth to booth filling baskets and bags with carefully nurtured produce as if they are gathering treasure. The farmers, bakers, CSA’s, and chefs proudly display their goods, ready to add a word of cooking advice. The shared positive energy of appreciation for the efforts of producers and support of buyers is palatable. Farmer’s market tables full of culinary inspiration! I picked up my sister’s Blades Orchard CSA box full of peaches, corn, lettuce, squash and peppers. As a lovely woman showed me round her “eightball” squash, I imagined row upon row-bursting with interesting vegetables. “You must have a magnificent garden!” I said. “I do,” she grinned back. Next door, I sprung for a loaf of multiseed sourdough bread – as beautifully made as it was tasty. 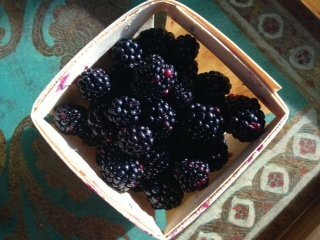 Those blackberries were jewels. Each one possessing a different burst of sweet and sour sprinkled with a bit of pride. Why not declare your love for locally grown produce! Car art stickers go anywhere-on your car’s back window, the gas tank cover, car body… or on anywhere! Define your laptop, or carry case! Decorate a door or window, book bags, bike helmets, school binders, luggage, mailboxes, instrument cases, skateboards, or wherever you want a little burst of art. Each Sticker is made of very DURABLE non-fade vinyl. (what they wrap cars & buses in!) tough stuff. This is an article about parenting through empathy. Take time to try and recall how you felt as a child in certain situations. Next, work to apply this mindfulness to your parenting practice. Learning good parenting is a life long journey with room for success as well as failures. It is tough to be a parent. I find myself constantly trying to recall how I felt at certain ages, so I might be helpful but not offend. It is easier sometimes to not speak up, but usually important and loving to do so. “The parenting police will get me if I don’t tell you!” I explain, or “The Mom Book of; teach your children well” means I know it won’t make for a happy moment but I would not be doing my job if I remain silent. Good parenting notions may be applied on a larger scale these days in the School of Right, Wrong and Slipping down a Slippery Slope. As the outside world grow more negative, it is important to try to be more positive. In summary when parenting, we teach others through our actions. We should always try to be our better selves. One way to stay to attain this goal is to be mindful by putting yourself in the shoes of another. My life inspires the art I create. 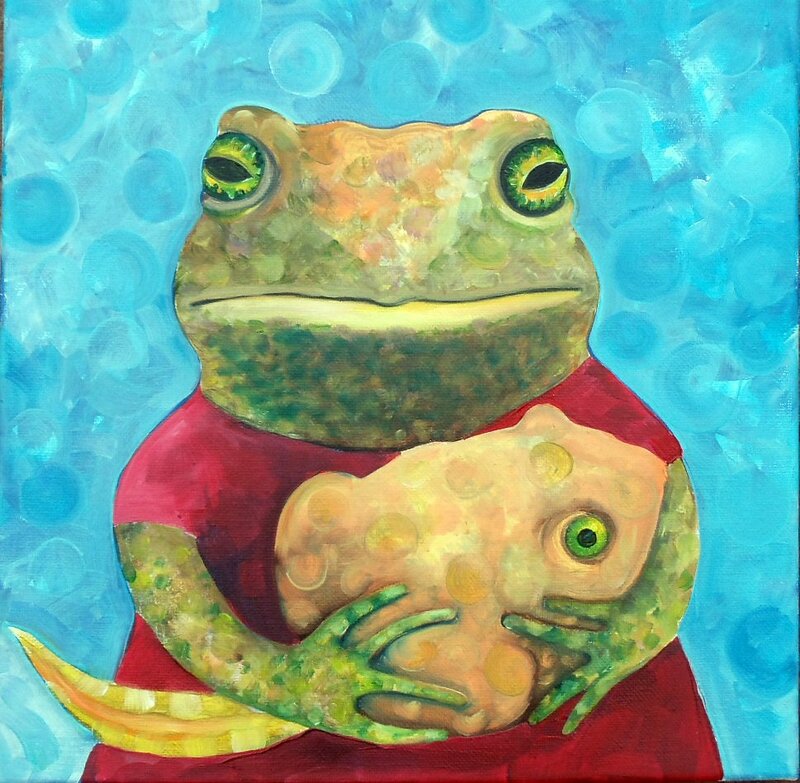 The above Mama Spadefoot Toad and Tad; is a prime example. It is frightening to dig in the garden in early spring before the Spadefoot Toads have gotten out of bed. I roused one up with my trowel. Mortified, I lifted her gently to inspect her for any damage. She hung in my fingers, regarding me with her calm bottomless eyes. Who could not fall in love? Her tiny hands were too lovely. I had to paint her and place something wonderful in her arms. Most all nature’s critters become parents at some point. Each family does their best to survive and thrive. As parents, we fall in love with our children and live to protect them through our actions and words. If only they could hear us through the same life experience with which we speak to them. Acknowledgement of others is a powerful way to strengthen relationships and increase fulfillment in life. The power of acknowledgement is vast and easy to set in motion. We all work hard toward what it is we need or want to achieve. Some days it is easy to get wrapped up in the general annoyance of feeling under-appreciated and over put upon. Take a mental step back and look at those around you- family members, coworkers, friends or complete strangers; each with their individual mountain to climb. An unsolicited word of acknowledgement may lighten the weight of their steps forward. Oddly you also may feel lifted as well. Tuck a note of acknowledgement into their lunch or leave it on their desk. Stop what you are doing and totally focus on the person you wish to acknowledge. 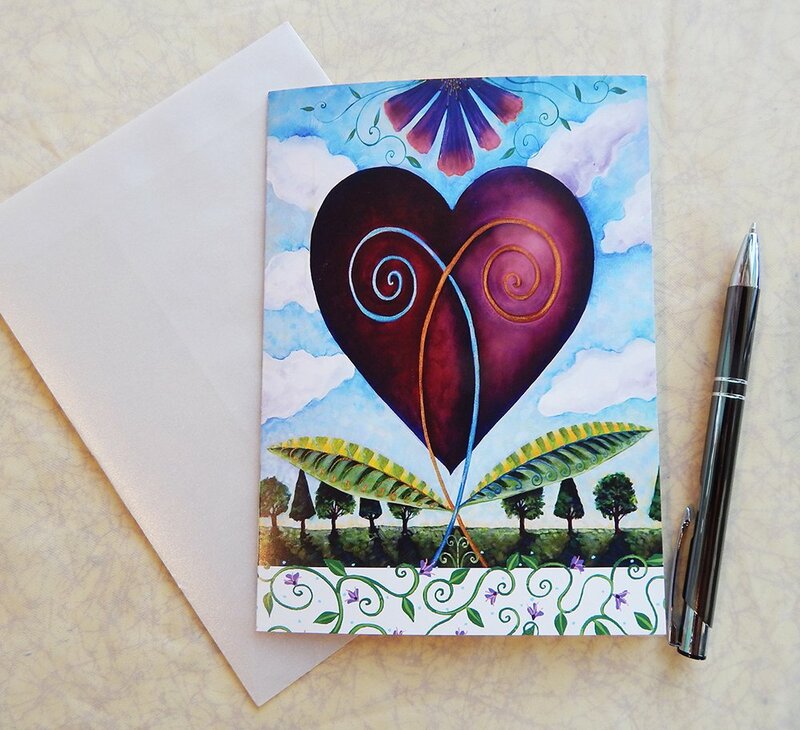 Send a hand written note or select a lovely card and include a message. Send a quick heartfelt email of appreciation. Praise someone for a job well done, especially nice for those you don’t know. A friendly wave and greeting to a stranger sends a burst of warmth their way. Look for the positive things people do so you can acknowledge and encourage them. Send a random text- to let someone know how much you appreciate them. Take a minute to let a manager know when an employee does a good job. Acknowledge people who are doing a good job – like a teacher or policemen. The written word is still treasured and carries greater personal wishes then an email. Each of my gift cards comes with a beautiful translucent vellum envelope. The US mail is old-school but the excitement of a hand written card from a friend is a true gift these days. One you can tuck away and pull out later to revisit.